Real-life Data Analysis: How Many Licks to the Tootsie Roll Center of a Tootsie Pop? Personally, I was not very satisfied with the owl's answer of “3,” so I decided to continue the little boy’s quest to find the number of licks required to reach the center of a Tootsie Pop. Once I selected my factors, I incorporated them into an experiment. 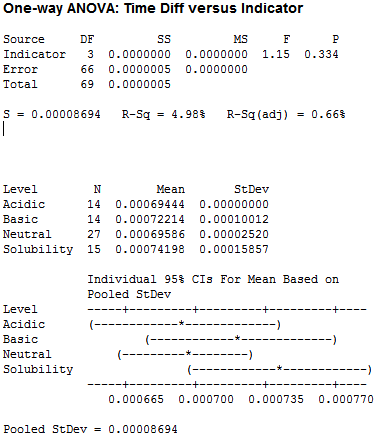 I chose simulate the different levels of each factor in the lab. For my force simulation, I placed my Tootsie Pop in a beaker with 150 mL of water and a magnetic stirrer. I placed the beaker on a hot plate that could spin the stirrer and create a circular motion in the water. I then pulled the Tootsie Pop out of the water every minute and measured the height and width of the pop on the thicker band around the pop. I did this each minute until the pop revealed a noticeable amount of chocolate (the elusive ‘center’). This method had some issues. The chocolate-flavored Tootsie Pops made the water very murky, so I omitted them from the lab testing. I also could not track the speed of the circulating water. Instead, I used the speed dial’s indicator on the magnetic stirrer (1 being slowest speed, 10 being fastest speed). After several tests at speeds 1, 2, 4 and 6, I was able to gather an ample amount of data to perform some analysis. I then moved on to the temperature tests. Like the force tests, these used a beaker, 150 mL of water, and a hot plate. I heated the water to different temperatures and measured the height and width of the Tootsie Pop every minute until reaching the center. The next test involved pH. I used a beaker, and 150 mL of water as the basis of my tests. I added a small amount of either baking soda (to make the solution more basic) or vinegar (to make the solution more acidic). I then recorded and measured the height and width of the pop at regular intervals. My final test, for solubility, consisted of putting the Tootsie Pop in a very large container containing a gallon of water. I dipped the pop in the water for one minute and took height and width measurements. In addition, I stirred the water to make sure it was diluted as possible and evenly distributed. My goal was to have enough data to analyze to help determine important factors in Tootsie Pop decay. I organized the collected data by the four factors: Force, Temperature, pH and Solubility. I wanted to look at the difference of the decay amounts for height and width during each minute or time period that I recorded. 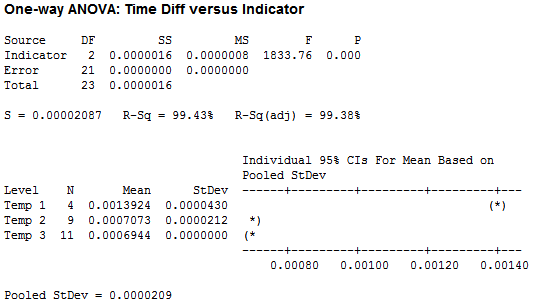 I first ran some One-Way ANOVA’s on the various factors. Below is the ANOVA I ran for Temperature. I used 3 temps: 56 C, 62 C, and 39 C respectively. While it does appear that there is a significant difference between temperature tests, the data for Temp 1 was taken at a temperature of 56 C (way above normal body temperature) and the measurements were taken about two minutes apart, instead of the standard one minute. My conclusion here is that temperature in the range of body temperatures really does not have an effect on ‘the number of licks.’ Unless you have a significant fever, in which case you might not be interested in a Tootsie Pop anyway. Clearly we have no significant difference between the pH tests, leading me to believe that the pH of our saliva should not factor into the number of licks. 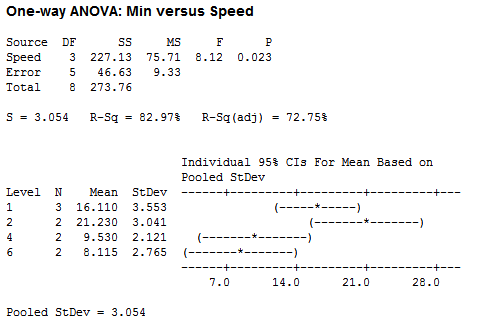 After doing an ANOVA on the total time it takes to reach the center and the corresponding speed, there appears to be a significant difference. But it should be noted that the pops used for speed 2 were incredibly perfect -- maybe the most perfect Tootsie Pops ever in both candy shape and Tootsie center location. 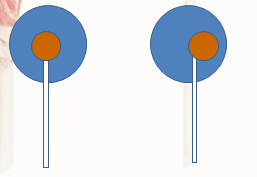 Hence, this difference may have been due not to speed, but rather to a greater distance to the center. Given slight offsets of the center, the side you choose would affect the number of licks. Overall, the number of licks I gathered does fit in the middle of the number of licks other researchers gathered, so I feel confident that my data collection was a success. Cory Heid is a student in applied mathematics at Siena Heights University in Adrian, Mich. He is interested in data analysis projects, as well as data-driven model building. Cory presented his Tootsie Pop findings at the 2013 Joint Mathematics Meetings in January, and at the Michigan Undergraduate Mathematics Conference in February.